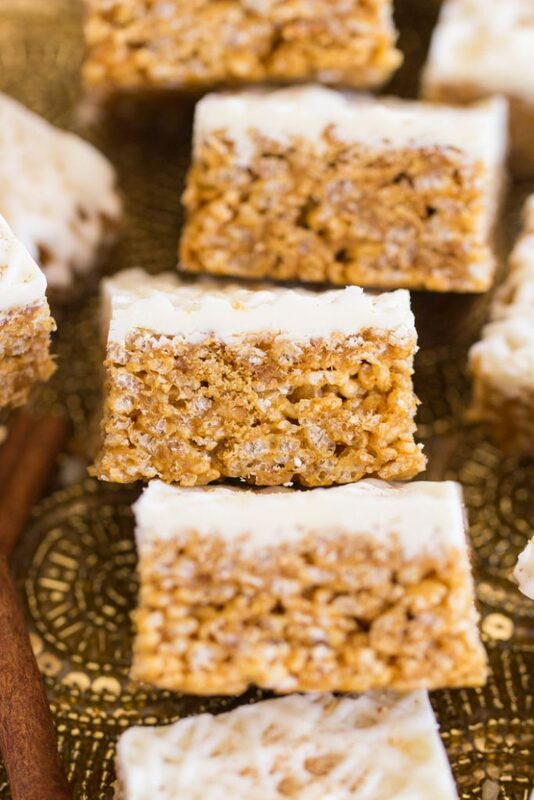 These Gingerbread Rice Krispie Treats get a festive kick of flavor from the addition of ginger, molasses, and crushed gingersnaps! Topped with a smooth, creamy layer of melted white chocolate that cuts the intensity of the spice. 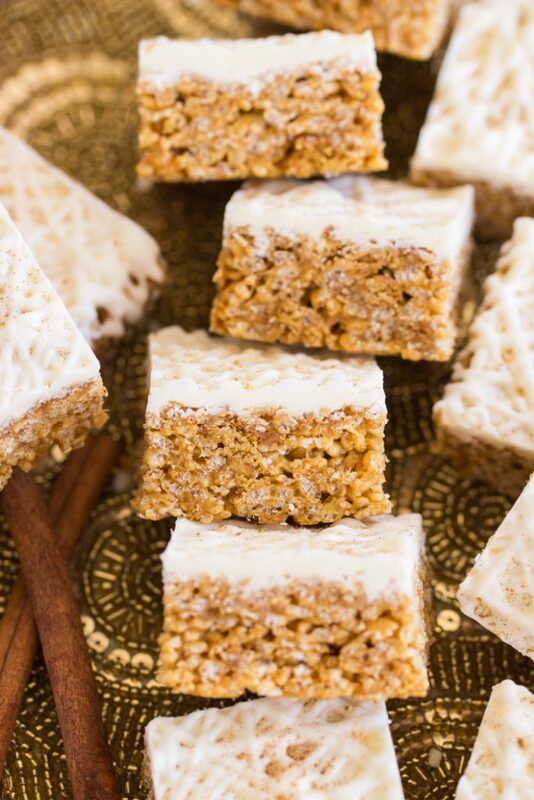 These Gingerbread Rice Krispie Treats are fantastic as a super simple holiday dessert! Remember the eclipse back in August? There was all that eclipse mania? My family went to a nice park and had a picnic. I brought these Gingerbread Rice Krispie Treats to our eclipse picnic over the summer – haha. I was doing a little unplanned Christmas recipe testing way back then. 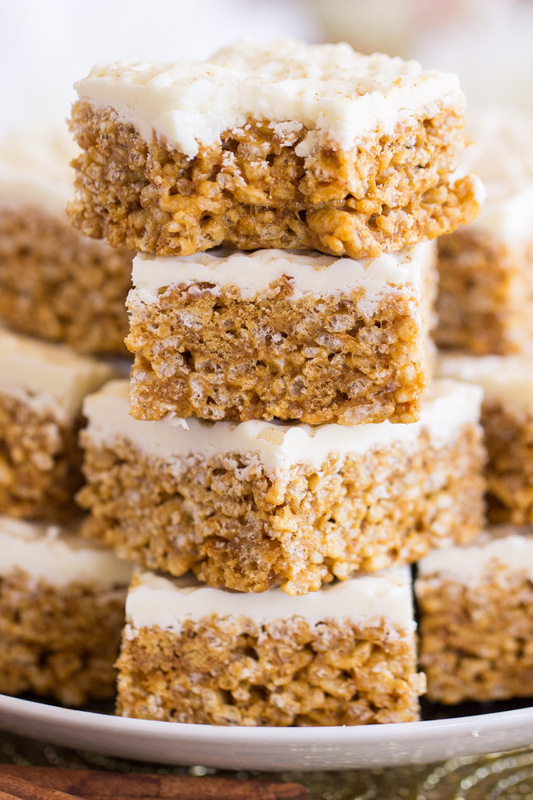 These Gingerbread Rice Krispie Treats were a spontaneous idea. 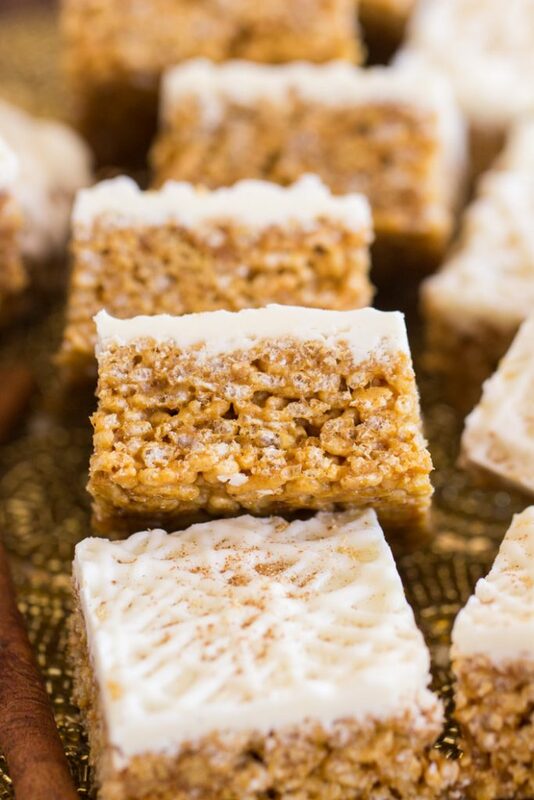 I was making Pumpkin Spice Latte Rice Krispie Treats for fall when the idea occurred to me to make a Gingerbread Rice Krispie Treats recipe. I already had enough marshmallows and cereal, so I just did it, even though it was summertime. Why not? Over the course of the year, I’ve shared a bunch of other variations on Rice Krispie Treats. They’re all exceptional. They’re not just variations for the sake of make a variety of RKTs. No, they are amazing options! 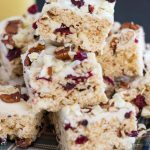 For other holiday versions, I have these White Chocolate Cranberry Pecan Rice Krispie Treats – everyone loves these, and I sometimes call them Christmas Rice Krispie Treats. I also have the aforementioned Pumpkin Spice Latte Rice Krispie Treats. 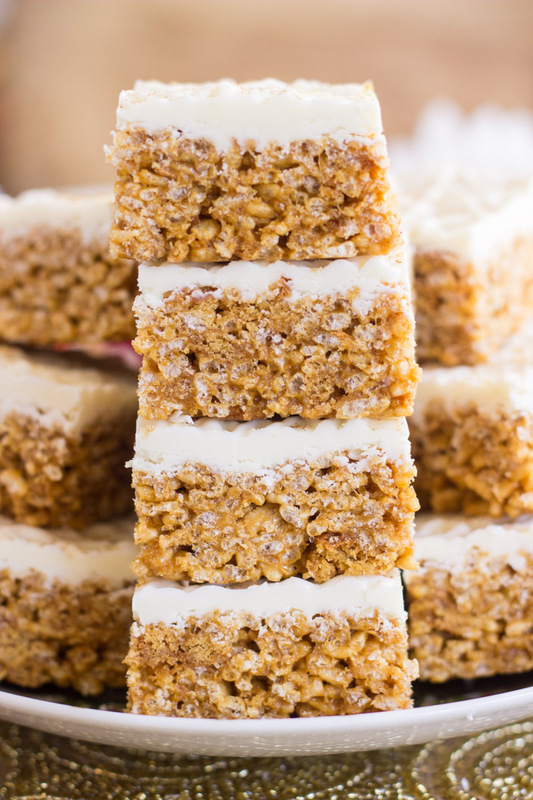 Both recipes are nearly as easy as standard Rice Krispie Treats, but significantly spruced up. 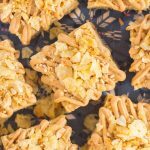 A few other Rice Krispie Treats recipes on the blog are these Cookie Butter Rice Krispie Treats and Nutella Rice Krispie Treats. The Nutella ones are incredible – my personal favorite. 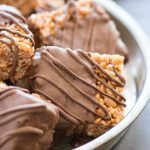 I almost forgot… for my fellow peanut butter lovers’, check out my Mom’s Chocolate Scotcheroos, which are always popular and well-loved, and my own spin are these extra peanut-buttery Peanut Butter Scotcheroos. Scotcheroos are so similar to RKTs, and just as easy. 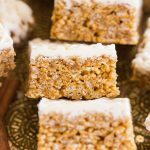 I love the kick of flavor that these Gingerbread Rice Krispie Treats get from the addition of ginger and molasses to the standard RKT recipe! I also added some crushed gingersnaps for a bit of crunch and extra spiciness. 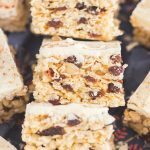 The white chocolate on top – I guess you could consider that optional – but I love how the sweet, creamy white chocolate cuts through the intensity of the spice in these bars. I personally preferred them with the white chocolate on top, and it only takes a few more minutes of time to do it. 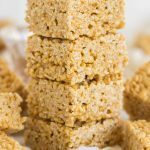 Between all those Rice Krispie Treats options, I’d say you’re all set for having super simple no-bake recipes for the holidays! Add marshmallows; cook and stir until marshmallows are mostly melted. Stir in vanilla, molasses, ginger, and clove. 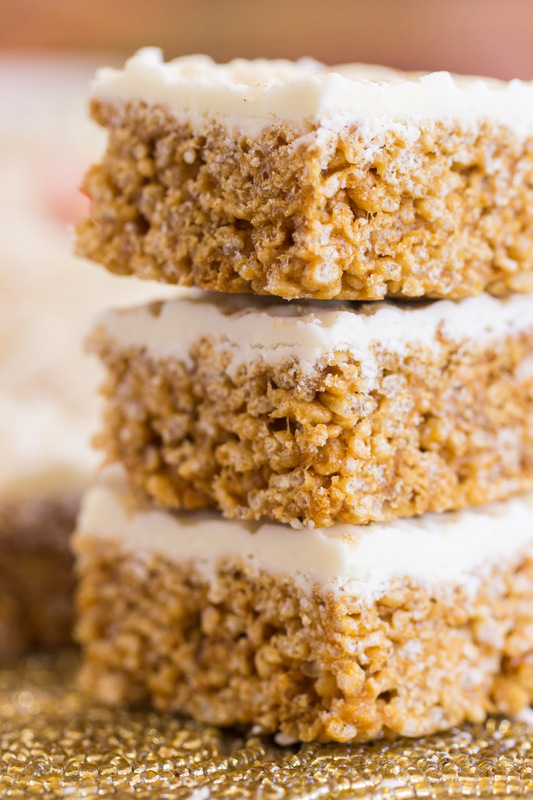 Remove from heat, and quickly stir in gingersnap cookie crumbs and Rice Krispies cereal. Press into the bottom of a buttered 13x9-inch pan. In a small microwave-safe bowl, combine the white chocolate chips and shortening. Heat at 20-second intervals until melted and smooth. Do not increase heat time intervals - the chocolate MUST melt slowly or it will scorch and turn clumpy. Short intervals, with stirring in between, until melted and smooth. Spread melted chocolate evenly over bars. Allow to set, about 15-20 minutes. Cut into bars.